Reduce waste while using your own coffee in this refillable Nespresso® capsule. The Italian-made, stainless-steel pod is compatible with several Nespresso® machines. Four interchangeable filter tops let you find your perfect grind, while the convenient dispenser and tamper make the capsule easy to fill and take on the go—without making a mess. I like this refillable capsule. It works, it is well made and the included tamper and filler device are well designed. I have tried several other refillable capsules for my Nespresso and they did not last or work well. I hope to see this product released with the option of getting two pods without buying the whole kit twice. Musicians and Waycap co-founders Davide De Ruvo, Matteo Pibiri, and Matteo Rossi went through a lot of throwaway Nespresso® coffee pods during their practice sessions. When they noticed the basket full of waste they created, they decided to make an eco-friendly solution. 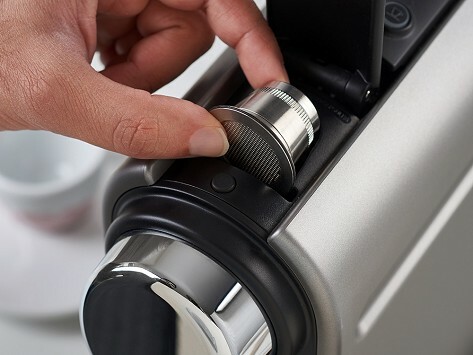 Their goal was to raise awareness of the damage caused by a "throwaway" lifestyle—and they did just that by creating a refillable stainless steel Nespresso® capsule. Made in Italy, each capsule not only lets you choose your own coffee, it includes four filter tops to achieve the grind of coffee you prefer. (More slits for espresso-ground coffee, fewer slits for a coarser grind.) The dispenser and included tamper are are easy to use, letting you fill the coffee evenly with no mess. It closes at both ends, so you can enjoy your personalized coffee with a conscience wherever you go.